Tomorrow, Governor-elect Greg Abbott will take the reigns from Rick Perry and officially become just ‘Governor Abbott.’ For the first time since the Clinton administration, Texas will have a new governor. Indeed, Perry has served in office for more than 14 years, shattering all the old records set by his predecessors. I’ve been putting off writing about this, because I do not necessarily feel qualified to editorialize about political events that transpired in 2000 or 2001. I was six years old when Perry assumed office, so opining on some of Perry’s first acts would be a lot like my father talking about his experience in observing Dwight Eisenhower or Allan Shivers’ respective tenures in office. Perry, of course, took office on December 21st, 2000, the day that George W. Bush resigned the governorship in preparation to become president. Perry had served as the Lieutenant Governor since 1999, and previously served two terms as Agriculture Commissioner from 1991 to 1999. He also served two terms in the Texas House of Representatives, from 1985 to 1991, the first two of which as a Democrat. I’m not going to meticulously go over the ebbs and flows of his time in office, others have done a much better job at that. Rather, I want to examine two ideas about Perry that have always stayed with me from his time in office. Contrary to what some may expect from me, they are actually quite positive. If this makes sense, Perry is an ideologue –but in a good way. When he first took office, his co-leaders were quite different. The Speaker of the House, Pete Laney, was a Democrat, and the acting Lieutenant Governor, State Senator Bill Ratliff (R-Titus County), was a tremendously moderate Republican who could absolutely not succeed in one of his party’s primaries today (think Nelson Rockefeller, except from East Texas). 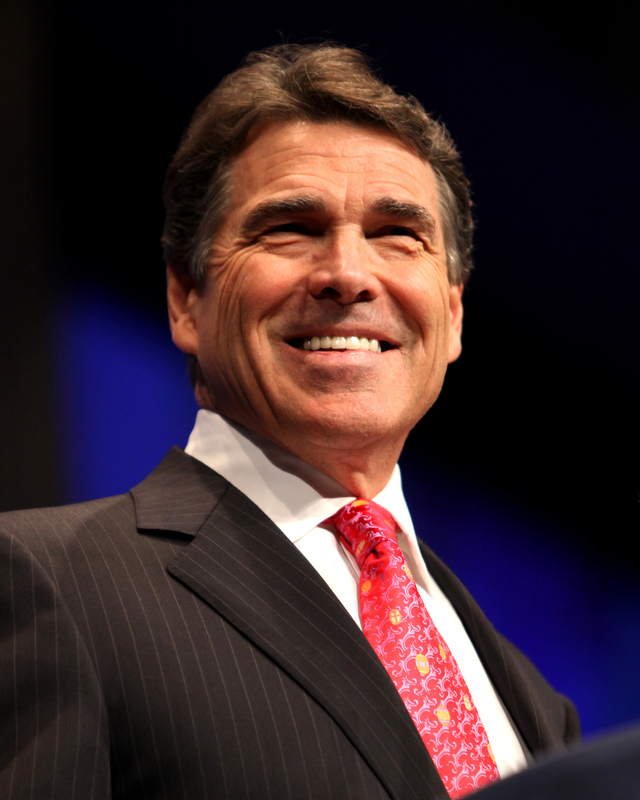 After the conclusion of the 77th Legislature in 2001, Perry vetoed a record number of bills. Even when compared to Ratliff’s successor, David Dewhurst, Perry was right-wing. Today, however, Perry is seen as an establishment figure. Bud Kennedy at the Fort Worth Star-Telegram opined that he could run for president as the “anti-Cruz,” a more pragmatic establishment type. Compared to, as of tomorrow, Lieutenant Governor Dan Patrick or Attorney General Ken Paxton (or even Abbott), Perry is on the moderate side of his party. Obviously, the governor did not tack to the left in an era when so many others zoomed the other way. On the other hand, Perry has a firmly planted set of core beliefs, which does not change because of partisan winds. Love him or hate him, that’s an admirable quality, one that is less and less common in successful politicians. Second, Perry — at his core — always appears to have all of Texas at heart. Sure, there was the rampant cronyism/corruption. But any even rudimentary student of Texas political history knows that is the rule and not the exception. Unlike Abbott or Patrick, in my opinion, Perry genuinely believed what he was doing would be good for the average Texan (as much as he may have been mistaken in some instances), not the average Republican primary voter. I have found myself agreeing more and more with the band of Democrats who feel that Perry’s successors will be considerably worse than him, and we will one day covet the comparable pragmatism in the Perry administration. There is certainly some truth in this, but it is important to not get carried away. Perry pushed through venal so-called “tort reform” that lobotomized much of our court system, including the resurgence of cruddy legal jurisprudence typically only found in Great Britain. He was instrumental in the horrendous gerrymandering scheme that reduced 90%+ of legislative districts to uncompetitive backwaters. More recently, he vigorously pushed the omnibus anti-abortion legislation that Wendy Davis filibustered and he attempted to coerce an unfriendly prosecutor into resigning by threatening (and following through) to veto funding (this is what he was indicted regarding). Obviously, Texas can’t get much worse off on many fronts, but on others it surely can. Perhaps most horrifying about Abbott and his ilk is that they have no central moral principles, nothing preventing them from grandstanding and demagoguery in the face of an increasingly extreme minority that monopolizes the political process. When they start demanding book burnings or the rescinding of the bill of rights, Perry would have rightly put his foot down. Abbott and Patrick, to the contrary, I’m unsure about. Adios, mofo. We’ll miss you (sort of). When it comes to state politics, if something feels different in the last couple of days, it is because things have — indeed — changed. A new crop of officeholders have taken office, namely Attorney General Ken Paxton, Comptroller Glenn Hegar, Land Commissioner George P. Bush, Agriculture Commissioner Sid Miller, Railroad Commissioner Ryan Sitton and a few new members of the Texas Supreme Court and Court of Criminal Appeals. In the next week, Governor-elect Greg Abbott and Lieutenant Governor-elect Dan Patrick, respectively, will assume their offices at the top. Despite not yet taking office, both men have already staked out positions both toward the far-right and toward the middle (leaning a little more to the former option). First, as the San Antonio Express-News reports, Abbott went on the offensive earlier this week on what he called the “Californization” (Californication?) of Texas. Specifically, he took issue with municipal bans on tree-cutting, plastic bags and fracking. Evidently, Abbott finds municipal bans on cutting down large trees uniquely objectionable, and he openly compared the practice to “collectivism.” He similarly fumed over municipal bans on single-use plastic bags, enacted in cities such as Austin and Laredo. The bag bans have particularly drawn the ire of legislators and politicos since they must spend so much time in the state capital. Finally, Abbott took a firm stance against Denton’s recent referendum to ban fracking within its city limits. Since the enactment of the ban in November, numerous legislators have filed bills to prohibit such bans statewide, and Abbott now looks amenable to signing such a bill. All this being said, perhaps there is something to be said for Abbott having at least one pragmatic side in office. The Fort Worth Star-Telegram published an editorial examining if Abbott is coming around on medicaid expansion. The statewide sentiment has recently turned against the opponents, but I’d still say true expansion is a longshot. Back in November, I opined in The Daily Texan that this was a possibility nonetheless, well before anyone else did. Moving onto Dan Patrick, he recently outlined his legislative priorities in a series of interviews. The Texas Observer reports that Patrick would be fighting for an ambitious conservative agenda while in office. The topics outlined were garden variety right-wing ideas involving tax cuts, immigration and school privatization, but a few novel specifics stood out. Among them was a proposal to rescind state funding for the Public Integrity Unit within the Travis County District Attorney’s office. The PIU, always overseen by a Democratic DA hailing from Austin, is typically a thorn in the side of prominent Republican officeholder, be it former Senator Kay Bailey Hutchison, former Congressman Tom DeLay or Governor Rick Perry. The Texas Tribune also looks at Patrick’s historically animosity toward the Senate’s 2/3rds rule. For those of you playing at home, the 2/3rds rule is an anachronism for the chamber stemming back to when it was comprised exclusively of Democrats. It requires the votes of 21/31 senators to advance any particular piece of legislation during the regular session. Patrick will likely get the needed votes to lower that threshold to 19 votes, conveniently just below the 20 Republican votes in the upper chamber. However, as the Brownsville Herald reports, Patrick could have at least something of a mind toward bipartisanship. State Senator Juan “Chuy” Hinojosa (D-Hidalgo County) has been selected as the President Pro Tempore of the chamber, meaning he would serve as the President of the Senate in the lieutenant governor’s absence. Last but not least, as the Houston Chronicle reports, Agriculture Commissioner Sid Miller has dedicated his first official act in office to implementing so-called “cupcake amnesty.” About a decade ago, the Department of Agriculture (which has power over school lunches) opined against parents packing cupcakes and other sugary foods in their children’s lunches. The policy was quietly reversed last year, and now Miller is wishing to publicize the change. Miller also noted that he has set his sights on removing restrictions on sodas and fries. “We’ve been raising big, strapping healthy young kids here in Texas for nearly 200 years and we don’t need Washington, D.C. telling us how to do it,” Miller said. Glossing over the obvious problems with that statement, Miller made a lot of sense when he noted that local control should be trumpeted in these cases. Sadly, it seems that local control is not respected unless it is convenient for Republicans, as Abbott has clearly shown. At least not in this political reality. I know, it’s a rather evocative headline, but the charts and stats I show below will hopefully convince you that the only thing that would guide Texas toward the left is huge national trends. As I have said before, I strongly believe that the Republican Party will go the way of the dodo in about 20 years or so, leaving behind a Democratic Party that gets so all-encompassing that it splits in two. Short of that, the GOP could realign in just as much of a substantial way. The great step to the right of the 1980s would be superseded by a step to the left in the 2030s, like the previous leftward step a century previous. The horrendous midterm results for Democrats have not shaken my belief that the Republicans are on a destruction course; in fact, it has only strengthened my resolve. However, the results specifically in Texas have lead me to believe that all the work of groups such as Battleground Texas has been in vain. There is little left to do now, for progressives, than to work together with moderate Republicans to elect pragmatic conservative candidates and to wait for the rising tides to guide Texas away from the rocks. I only wish it will not be too late by then. State Senator Wendy Davis (D-Tarrant County), the Democratic candidate for Governor, lost her race by twenty points, 39-59. Governor-elect Greg Abbott performed better than Governor Rick Perry in all three of his elections. For the downballot elections, all the other Republicans won by comparably margins. The Lieutenant Governor’s race was the closest, with the Democrat losing by just more than 19 points, and the US Senate race being the biggest blowout, with Senator John Cornyn being re-elected by more than 27 points. The Republicans re-took the US Senate, meaning that — all other things being equal — Cornyn will now be the Majority Whip of the Senate. Locally, Harris County went straight Republican, whereas Bexar County was a reddish shade of purple. Neither showed any improvement from 2010 (I didn’t realize how many judgeships the Democrats won in Bexar in 2010), though, with the big exception being that Nico LaHood (D) defeated Susan Reed (R) and was elected District Attorney in Bexar County. In Harris County, the GOP slate generally beat the Democratic one by about 10 points, though certain races were closer. DA Devon Anderson defeated her Democratic challenger, Kim Ogg, by only about six points. Though it is important to note this was just a special election for the post, and it will be right back on the ballot in just two years. Davis’ State Senate also fell to the Republicans, specifically a woman named Konni Burton. This puts the party in control of 20/31 seats, just shy of the coveted 2/3rds needed to ramrod legislation through. However, Lieutenant Governor-elect Dan Patrick will likely disassemble that rule anyways. In the State House, the Republicans picked up three seats. State Representative-elect Wayne Faircloth (R-Galveston County) prevailed in the district currently held by retiring Democrat Craig Eiland. Meanwhile, State Representative Philip Cortez (D-Bexar County) was defeated by Rick Galinda and State Representative Mary Ann Perez (D-Harris County) was defeated by Gilbert Pena. Also around the state, voters in Denton approved a measure to ban hydraulic fracturing (fracking) within the city limits. This has prompted the Oil & Gas Associated, as well as the General Land Office, to file suit against the city. Watch out for the Legislature passing a law disallowing these types of referendums next session. Now, I’ve put together a few charts. First up, I compared the counties won by the gubernatorial candidates in 2010 (top) to those won in 2014 (bottom). Obviously, blue for the Democrat and red for the Republican. Obviously, Davis won fewer counties than Bill White, the 2010 Democratic candidate. Most notably, she didn’t win Harris County, although it is important to note that White was a former Mayor of Houston and that Abbott is also a Houstonian. But Abbott also won three southern counties that White triumphed in. I don’t know if you could call locales like Kleberg County (fourth from the bottom on the coast) part of the Valley, but it is more than 70% Hispanic. Davis did worse than White, worse than Chris Bell (2006 Dem nominee) and worse than Tony Sanchez (2002 Dem nominee). In fact, if you look at the margins of victory in recent gubernatorial elections, it appears as though the trend is for Democrats to do worse as time goes on –quite different than what common knowledge would have you believe. Now, in 2010, the Democrats had a rather unremarkable candidate for Lieutenant Governor: Linda Chavez-Thompson. With only slightly more resources than Jim Hogan, she ran a truly awful campaign. And when she went up against Lieutenant Governor David Dewhurst, she did even worse than the Democratic nominee this year. State Senator Leticia Van de Putte, the Democratic candidate, did win a net 2 more counties in the south, including Kleberg. Sam Houston, the Democratic candidate for Attorney Genera, won a few more southern counties. He carried Jefferson County, the home of Beaumont (that blue speck in the right corner), the only Democrat by my calculations to do so. Granted, this map compares David Alameel’s, the Democratic Senate candidate, performance to the 2012 election, but it is still striking. Alameel was the worst contender of all the Democratic ticket, and for good reason. The other major point is that ticket-splitting has decreased rapidly. The range of the losses was about 37 points in 1998, decreased to about 25 points in 2002, 16 points in 2006, 17 points in 2010 and only 8 points last Tuesday. Like I have opined in the past, this is likely because of the growing stupidity of the average Texan, and the rise of “FOUR LEGS GOOD, TWO LEGS BAD” style straight-ticket voting. Finally, I wanted to look into how much Democrats have improved in Bexar and Harris counties. Unfortunately, there is no silver bullet for finding just how Republican an election is in these counties before 2010, back when ticket-splitting was still commonplace. Ultimately, I settled on straight party voting, which is a rather bad barometer, but it beats nothing. These are bad measurements for a couple of reasons, namely that they overstate Democratic support. While Democrats received more straight ticket votes than Republicans in 2006 in Harris County, they still loss the whole county and all the positions. And 2000 wasn’t a close election either. But these graphs should just illustrate, rather unscientifically, that there is no meaningful improvement for Democrats in either county in midterm elections. If I have an abundance of time, I will average the margins of victory for all the countywide elections in a given election year to find a more accurate number. As I have opined before, since Davis and the pack did not crack the 40% mark and did convincingly worse than 2010, Battleground Texas will be no more. Snuffed in its infancy. Either it will just fold in the next few weeks or its budget will be slashed so significantly that it will become a non-entity in practice. Most of the people running that rolling calamity will likely be out of a job. I’m going to leave my rationale for why the Democrats got whupped so monstrously to a latter post, but let’s just say there are quite a few reasons. The most important reason, however, is that the average Texan is evidently both too stupid and too lazy to be bothered to participate in the political process. A pitiful 1/3 registered voters participated. Campaigns can do what they want to drive turnout, but until young people put down the blunt and the funyuns long enough to “occupy” a voting booth, nothing will get any better for the Democrats. Until other non-voters get up off their butts and stop being worthless, ‘poor and puny anonymities,’ politics will continue being dominated by the far-right. At the end of the day, however, in a democracy, people get the government they deserve. Lazy Texans will get that government many times over in the succeeding years. Big Jolly Politics, Brains & Eggs (Parts I, II, III, IV), Eye on Williamson, Off the Kuff and Texas Leftist all have more. Even though more than half of early voting has already gone by, newspapers are still fielding endorsements for statewide elections. Most of the big newspapers supported State Senator Wendy Davis (D-Tarrant County), the Democratic candidate for Governor, such as the Houston Chronicle, San Antonio Express-News, Austin American-Statesman, Corpus Christi Caller-Times and the El Paso Times. The major exceptions, those who supported Attorney General Greg Abbott, the Republican candidate for Governor, were the Fort Worth Star-Telegram and The Dallas Morning News, as well as a plethora of small-town papers. For some of the downballot contests, no such diversity existed. The Lubbock Avalanche-Journal was the only paper, of any size, I could find that supported State Senator Dan Patrick (R-Harris County), the Republican candidate for Lieutenant Governor. And I found not a single paper that supported either State Senators Ken Paxton (R-Collin County) or Glenn Hegar (R-Harris County), the Republican nominees for Attorney General and Comptroller, respectively. Not one. Needless to say, there aren’t any good reasons to vote for these men. I suppose, if you truly believe in conservative principles, there is a legitimate point to be made in not wanting to support the Democrats, but it is just inexcusable to support these stains upon the GOP ticket. Patrick is a demagogue in the style of Huey Long, though he is considerably less intelligent and less opaque in his nefarious intentions. Paxton is a lousy attorney and likely could be convicted of a felony in the coming months. Hegar openly admits he has no idea what he would do in office as the State’s top financial watchdog. Not to appear too eager in criticizing the Republicans, Democrats have an exceedingly terrible candidate on their statewide slate too. Actually, many of my compatriots tend to think that David Alameel, the nominee for the Senate, fits that description, but I’m talking about Jim Hogan, the Democratic candidate for Agriculture Commissioner. I’ve opined previously on my myriad objections with Hogan — he’s a no-name, no-campaigning political novice who is smug in his complacency and total ignorance of state issues. He has some experience as a farmer, which is great, but he knows nothing of school lunch programs, regulating gas pumps or the multitude of other issues that the commissioner must oversee. Here’s the entire article back from July about why I would never vote for Hogan. Not a single organization I am aware of has endorsed Hogan. All the newspapers or other non-partisan organizations have supported former State Representative Sid Miller (R-Erath County), the Republican, while even the big Democrat groups have suggested undervoting. A few other blogs, namely Brains & Eggs, Jobsanger and Socratic Gadfly, have supported Kenneth Kendrick, the Green nominee, as did this publication. If you are an otherwise reliable Democratic voter, I have previously made the argument in the past that Kendrick is the only reasonable choice. Unlike many within the Green Party, his political views aren’t to the left of Marx; rather, they are somewhere around the median of what I figure a Texas Democrat would be. But still, some Democrats loathe supporting the Green Party out of principle. For those of you who fit that description, just undervote, but please do not vote for the Democrat. Unfortunately, my words will fall on deaf ears for most. Admittedly, the absurdly long ballot makes intelligent voting rather difficult. But at least for the statewide races, don’t be afraid to split your ticket. Texas elected some mix of statewide Democrats and Republicans for about 30 years between the 1960s and 1990s. The 1998 and 2002 elections, even though they were GOP sweeps, featured a serious range in how close the challengers got. In 1998, for example, some Republicans won by 31 points while others won by only 2. In 2002, the range was anywhere from 32 point victory margins to 5 point ones. Fastforwarding to 2010, the range shrunk to only a few points between the high water mark and the low one. The direct cause is straight ticket voting, but the indirect cause is that Texans have gotten less politically astute in the preceding two decades. At the beginning of this century, people all over the state could subscribe to any number of newspapers. Those in the rural areas had the ability to do so, and those in the suburbs had the will-power to do so. But then the newspapers cut back causing talk radio and Fox News to fill the void. More importantly, Barack Obama, the most divisive President in recent history, came to power and caused a fierce nativist backlash, fueled by racial animosity, known as the Tea Party. Democrats fired back in kind, and solidified themselves into their own camp as well. Now, most Texans just get their news from the monitors at gas stations and Instagram. We think of ourselves as belonging to a political party in the same respect as rooting for a football team, and that is the extent of the rational discussion of the issues, if one is even among the 29% of Texans who aren’t too lazy to vote. Newspapers, blogs, NPR and a couple of other serious sources promote serious debates on the policies, but this is drowned out in the cacophony of partisan chest-bumping. 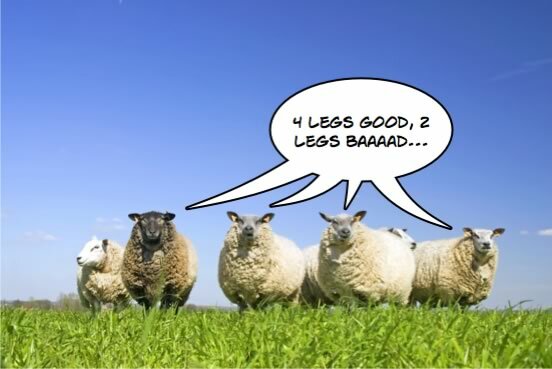 Think of the scenes from Animal Farm when Snowball and the other well-intentioned pigs attempt to make serious policy decisions, but are drowned out by the sheep bleating “FOUR LEGS GOOD, TWO LEGS BAD.” That is basically what straight ticket voting does. Don’t be a sheep, don’t be dumb. Actually scrutinize your ballot. First and foremost, a poll was released by The Texas Tribune today that appears to place the final nail in the Democrats’ coffin. Now, as I have opined time and time again in the past, I’m not really a fan of the Tribune’s polling, so take this with a grain of salt. But with Attorney General Greg Abbott, the Republican candidate for Governor, leading State Senator Wendy Davis (D-Tarrant County), the Democratic candidate for Governor, by a whopping 16 points, the margin of error is taken care of more than five times over. I’ve attached the polls for all of the statewide non-judicial contests. Of note, because of rounding errors, the Land Commissioner poll should not equal 100. Excel insisted upon putting Bush’s total at 51% anyways, but the Tribune poll only put 50%. These polls put the Democratic deficit anywhere from 15 points (Agriculture Commissioner) to 26 points (US Senate). The poll basically insinuates that there are people who are voting for Wendy Davis, yet are splitting their ballots for Dan Patrick. Or thinking that Jim Hogan is a sensible, qualified and tempered candidate for Agriculture Commissioner (he’s none of those things), and yet Ken Paxton is the superior choice for Attorney General. Do these people truly exist? Are Texans truly that inept? I say no, and think those absurdities prove that the poll is just a bunch of stuff, as the Vice President would put it. The polls also show third parties getting huge percentages of the vote, sometimes nearly 20%. That’s a little bit silly, considering that they rarely surpass 5%. I tend to think the reason for their gross overperformance is that the poll is largely conducted via eager participants on the internet. You know, the people who have the extra zeal to come up with their own outlying political views. Let’s get something clear, no statewide Democrat is going to win this year. That much I am certain of. But the Democrats don’t have to literally win in order to win, as counter-intuitive as that might sound. The slate needs to outdo Bill White’s performance in 2010, which was roughly 42%. Ideally, they should do well enough to lift the ticket in Bexar County (San Antonio), Harris County and Nueces County (Corpus Christi) enough to elect some local Democrats. But showing progress from the last election is the most important thing. Battleground Texas will keep registering voters, demographics will keep moving in a good direction and Texas will transition inch-by-inch into a purple state. Vox made a similar point today. Bud Kennedy at the Fort Worth Star-Telegram noted today, though, that the Texas Democrats have a considerable chance on not outdoing their 2010 performance. If the slate is less than 42%, alarm bells will ring. If it ranges from the high to low 30s, as this poll might suggest, it will be Armageddon for Texas politics. Battleground Texas will likely disband. National Democrats will think of the short-lived project to turn Texas blue and shake their heads. In the bars of Manhattan and Capitol Hill, it will be thought of with the same naivete as the New Coke debacle. I really don’t want that to happen. Through the first four days of early voting, the numbers are negligibly different from four years ago, with some minor differences I’ll note in tomorrow morning’s issue of The Daily Texan. That will be what determines how well Davis does. So please, please, vote. This should be a long and intellectual editorial about the political history of the Attorney General’s office, about the nuanced policy disagreements between the major candidates and the different criteria one should use before making a decision on whom to support for the state’s top lawyer. But this decision is just not complex enough to warrant all that. One candidate is an admitted crook, and should stay far away from high office. State Senator Ken Paxton (R-Collin County) has admitted to engaging in securities fraud, a felony in Texas, when he solicited clients to a capital management firm without properly registering himself, despite being paid to do so. He has been officially reprimanded and fined by the State Securities Board. The Public Integrity Unit of the Travis County District Attorney’s office has even initiated an investigation against Paxton, though any indictments that might be issued would not occur until after the November election. Now, if Paxton wins the election but still gets disbarred for his unethical behavior and just shoddy lawyering, he would still be able to continue on in office (our state’s founding fathers, in their grand wisdom, decided you don’t have to be an Attorney to be Attorney General). But if convicted of a felony, he would be removed from office. This is not that small of a possibility. In our opinion, Paxton is already a confessed crook. Someone like him is either too nefarious or too mindless to follow the law; either way, he should not be rewarded with the privilege to help enforce it. And Texas should not have to relive the excitement of the 1980s when it comes to dealing with public officials who have been found guilty of felonies. The Democratic candidate, Sam Houston, has a great deal of problems himself that make us think perhaps he is also not ready for prime time. But being camera shy and perplexed on some more complicated issues is a far cry from a felonious crime-spree. Houston specifically has a rather unclear stance on what criteria the Attorney General should use when determining to defend a state law or not. We don’t know exactly what he believes, and this ambiguity troubles us to some extent. However, we do agree with Houston on many of the underlying principles, such as personal opposition to Texas’ strict anti-abortion laws and homophobic constitutional amendments. In our view, the second-most obvious difference between Houston and Paxton is their legal experience. Paxton is a second-rate lawyer who has been propped up merely by his skills in Tea Party rabble rousing. Sam Houston, on the other hand, is a well-respected attorney in the City of Houston area, focusing on litigation as a named partner in a major firm. Though most of all, Houston is willing to approach the issues of the Attorney General with an open mind. This stands in contrast to Paxton’s small and petty ideological approach, which results in the exact type of hubris that can lead to the aforementioned hubris. What type of laughing stock will Texas be when it has the only Attorney General in the country who is no longer an attorney? We’re not sure what the punch-line would be, and we don’t care to find out by electing Paxton. Accordingly, this board endorses Sam Houston for Attorney General. The Texpatriate Editorial Board is comprised of Noah M. Horwitz & Olivia Arena of Austin, George Bailey of Boston, Luis Fayad of College Station and Andrew Scott Romo of New Orleans. Editorials represent a majority opinion of the voting board. The gubernatorial election has obviously received a great deal of publicity this year, as has (to a lesser extent) the lieutenant gubernatorial election. Little ink has been spilled, though, covering the contentious race for Attorney General. The race is between State Senator Ken Paxton (R-Collin County), the Republican, and the fortuitously-named Sam Houston, the Democrat. Houston is an attorney from a City that bears his name, who has previously run for the Texas Supreme Court. Paxton, who has been in the Senate since last year and previously served in the State House for a decade, is one of the most extreme conservatives in the legislature. Paxton, for his part, is a pretty shoddy lawyer who himself is vying for top lawyer job in Texas. As The Dallas Morning News refreshes us on, he is facing possible felony indictment for improperly steering clients in his law firm toward an investment firm that he had a stake in –without properly disclosing as much. The Public Integrity Unit of the Travis County District Attorney’s Office (sound familiar?) is currently investigating this. Now, the general public certainly does not know this, so Paxton is hoping to keep this race rather low profile, so that he may simply cruise to victory on straight-ticket voting. Houston, for his part, is fighting back to try to ensure that does not happen. At the start of the week, Houston challenged Paxton to a televised debate, in a high-profile speech where he lambasted his opponent for hiding out of sight from the public. Paxton’s campaign has responded by calling the debate-request a “ploy.” Just think about that, we’ve gotten to a point where a request to compare political positions is somehow a ploy. Anyways, Paxton himself thinks he is sitting pretty before November. The Houston Chronicle reports that his campaign’s internal poll has shown that Paxton leads Houston by 24 points, 52% to 28%. The logistics of the poll and its methodology make the results somewhat suspect, but one would be hard-pressed to find anyone who does not stipulate Paxton’s huge lead in this race in some capacity. I’ll admit it, I had some serious doubts about Houston’s candidacy when it was first announced last year. He has no political experience whatsoever, and a good name can only take you so far. But Houston has positively surprised me in many ways. His campaign team is impeccable, and they have been running a very effective ground game thus far in the year. Of course, it does help immeasurably that his opponent is equal parts extreme and inept, both of which are qualities making him enormously unfit for high executive office. I honestly don’t know if Paxton’s alleged transgressions would be a result of incompetence or just him being a crook, and, frankly, I don’t really care. Either way, he shouldn’t be the Attorney General.